June is Healthy Choices Month at Kings County Tennis League. Our students have participated in a series of off-court discussions about nutrition and exercise, and this coming weekend, during Family Day, we’re having a fitness challenge! 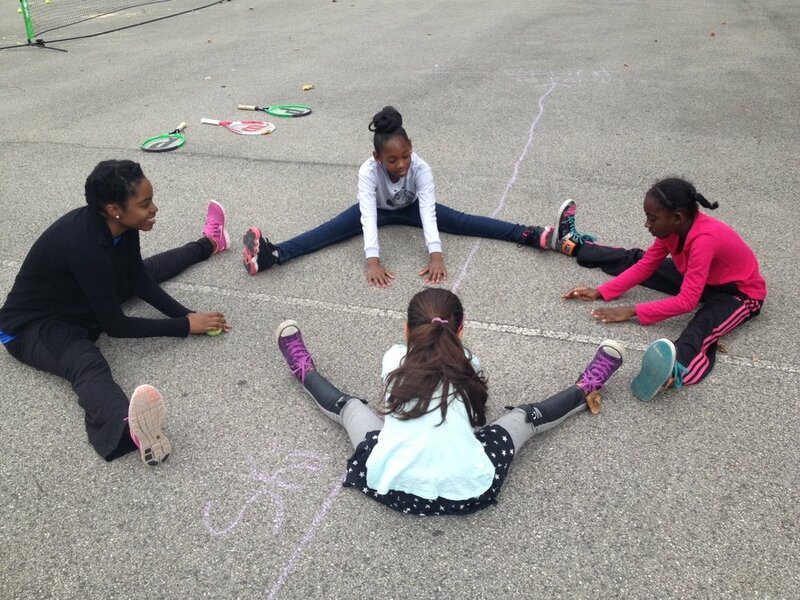 At Lafayette Gardens, where there is no physical tennis court, but a large open blacktop space with portable nets and hand-drawn lines, Educational Coordinator Ari recently led an informational, interactive game called “This or That.” Quite fantastically, the game combines exercise and nutrition! Ari presented her students with two different foods—each set at opposite ends of the court—and directed them to decide which is nutritionally superior. They were instructed to declare their choice by running to the end of the court at which the perceived healthier food was located. The decisions were individual, not team-based. Each child independently ran to the side that reflected his or her own personal opinion. After each sprint to a food choice, Ari led a discussion about which choice was, in fact, nutritionally better and why. It was definitely an excellent educational opportunity for all of the participants. Lafayette Gardens may lack a real tennis court, but, evidently, this cannot stop the team from using its makeshift tennis surface in a creative way. Most of us look at a tennis court and see only one purpose: to play a specific game. But at KCTL, we use the tennis court—"real" or not—for activities and lessons of all kinds. Stress Management was a timely off-court discussion topic this past Saturday at Marcy, where our students were about two weeks into the school year and two weeks away from the end-of-season Jamboree tournament. In between match play station drills and games, the kids chatted with Gary at a court-side picnic table. The table seats about four to five people comfortably, so Saturday’s conversations were a bit smaller and more personalized than usual, allowing for greater individual contribution from each student. The small groups spoke extensively about school-related stress. “Is a particular subject going to stress you out?” Gary asked to introduce the concept. Yes, while the kids are mostly comfortable with the upcoming school year, they remarked that they’re worried about one or two classes, and they agreed that stress is no fun. Stress causes poor health, they explained; stomach problems, bad eating habits and disorders and insufficient sleep are often the products of one’s nerves. Fortunately, the kids keenly understand how stress also motivates them to do better and promotes a sense of urgency. Moreover, they’re all well prepared to handle academic stress effectively. The Marcy kids pointed to music, friends, teachers and guidance counselors as their favorite resources for stress reduction. Gary connected the upcoming Jamboree to the previous reflections on stress. “Will you be worried on Game Day? Will the competition and the eyes of your friends, family and other spectators cause you stress?” Luckily everyone agreed that nerves in sports are a positive thing in that they promote healthy competition.They closed out the conversations with reminders to practice good sportsmanship in the tournament. Our off-court talk at Marcy was all about the upcoming 2014-2015 school year—now just around the corner for our students. Gary began the discussion with an announcement and a question: “One month from today, you will go back to school. How do you feel now that summer is almost over?” The question received mixed responses. Some kids were enthusiastic, while others were disappointed. The latter group didn’t shock us; we remember how happy they were to have begun summer vacation a few months ago. After the reminder that summer’s freedom is officially slipping away, we moved into expectations for the upcoming school year. How will this year be different than the last? Advancing to a higher grade means the work will be a bit difficult, they said. At the same time, they remembered that they’ll get to reunite with both old and new friends upon returning to school. This heightened everyone’s excitement and led more to express that they’re now looking forward to the school year. The conversation ended with questions about favorite subjects and future careers. We learned that Marcy has a few aspiring scientists, media professionals and artists! This week for our off-court talk, we focused on Fitness & Nutrition. We discussed what are healthy foods, and what is consider not healthy for them. We also talked about how many meals per day we should eat each, and how the size of the portions we eat also matters in maintaining good health. We talked about the effects drinking plenty of water verses drinking countless cans of soda or sugary juices, and how water with every meal helps their complexion and helps cleanse their body. We discussed hydration verses dehydration and the effects of each. At Tompkins, we provided bananas and carrots to the students as part of the discussion on nutrition--as well as hummus, which many of the students were willing to try! Regarding the Fitness discussion, we found out that many of our students are very active in one way or another... many mentioned that they exercise with family members and play other sports. This topic was one that the students really enjoyed expressing their views about, so much, that we'll likely revisit it again next week. Our Off-Court discussion this week was about the Environment/Recycling. We talked about ways we can help protect the environment, and we discussed recycling. We asked our students what they knew about the subject recycling... many of them knew a lot about recycling! We discussed the 3Rs: reduce, reuse, recycle. We discussed littering and the harmful effects it has on the environment. We talked about how the trees and plants help the environment by producing clean oxygen. I asked our students what they knew about landfills. Most of the older students knew what a landfill was. We talked about air pollution. Mainly about how all the cars in NYC pollute the air, and what we could do to reduce air pollution. Our kids stated that walking was a great way to reduce air pollution (and a great way to stay in shape!) or to ride a bike or travel using mass transit. We're asking all of the students to bring in an item that was recyclable and one that isn't. Lafayette Garden students can bring their items to Candice and Marcy students can bring their items to Gary. A prize for the winner will be determined by Michael. Saturday’s off-court discussion at Marcy called for a bit more creativity than usual. Gary posed the question, “How do you see the world in 25 years?” to kick off the conversation. Of course, there are no objectively right or wrong answers, so the students were inspired to use their imaginations. The kids made a number of fun predictions about what human life will be like in 25 years--mostly related to technology. For instance, the kids expect that by 2039, hovercraft cars and vacuum tube trains will be our primary modes of travel, while gas-powered cars and existing modes of public transit will become obsolete. They also anticipate robots assisting with human beings’ daily functions and tasks, providing a great benefit to mankind. In addition to their expectations for technological advancement, the students brought up some more meaningful ideas about life 25 years away. For one, they were confident that a woman will be—or will already have been—President of the United States by 2039, and pointed to some of our female volunteers as possible candidates. They also spoke of their hope for environmental improvements. People will have to change their habits now, the kids said, if we want to enjoy a clean and beautiful environment in the future. 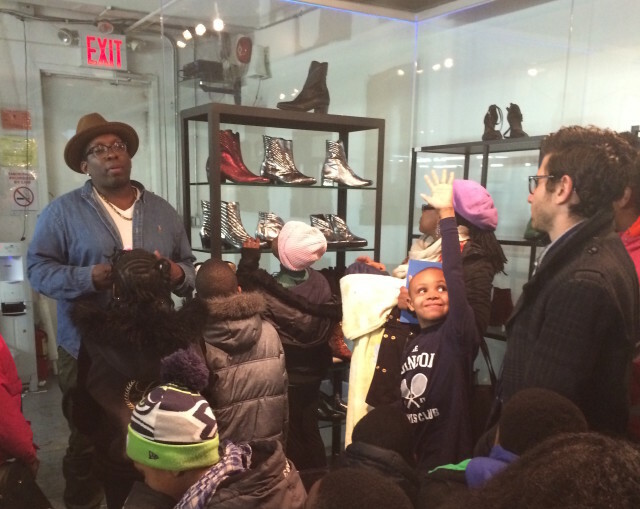 All in all, the Marcy students expressed desire that our future world will be a better place. More importantly, they touched upon an important reality: While we can’t possibly guess all the little details of the distant future, we can modify our current actions to shape the big picture into something positive. “Happy!” the students shouted in unison--no surprise there! Summer’s onset is just about the most exciting time of the year for any child. Even though our kids were expectedly thrilled to have temporarily escaped the woes of waking up early, being on their best behavior, doing homework etc., they agreed that the most recently completed school year was a good one, and spoke positively about their teachers. Gary asked, “Who is your favorite teacher, and why do you consider him or her to be the best?” Their responses were varied, but it seemed like Science, Physical Education and English Language Arts teachers received the most votes. The most likeable teachers are those who dedicate the most time and energy helping students get through difficult topics, the kids explained. Conversely, we explored what actions make a good student, either in school or at KCTL, to encourage appreciation for a learning relationships from both perspectives. As a group exercise, we asked a few kids to pretend to be “teachers,” while the rest listened as “students.” The teachers led a tennis lesson by demonstrating proper technique for groundstrokes. Afterwards, we asked the teachers how it felt to stand in front of the “class” to educate students about an assigned topic. They said that they felt nervous at first, but soon became relaxed and confident about the experience. Our exercise was a success! The kids understood the effort required to successfully teach a class. We closed out with a discussion about who would like to become a teacher someday before returning to rallying. 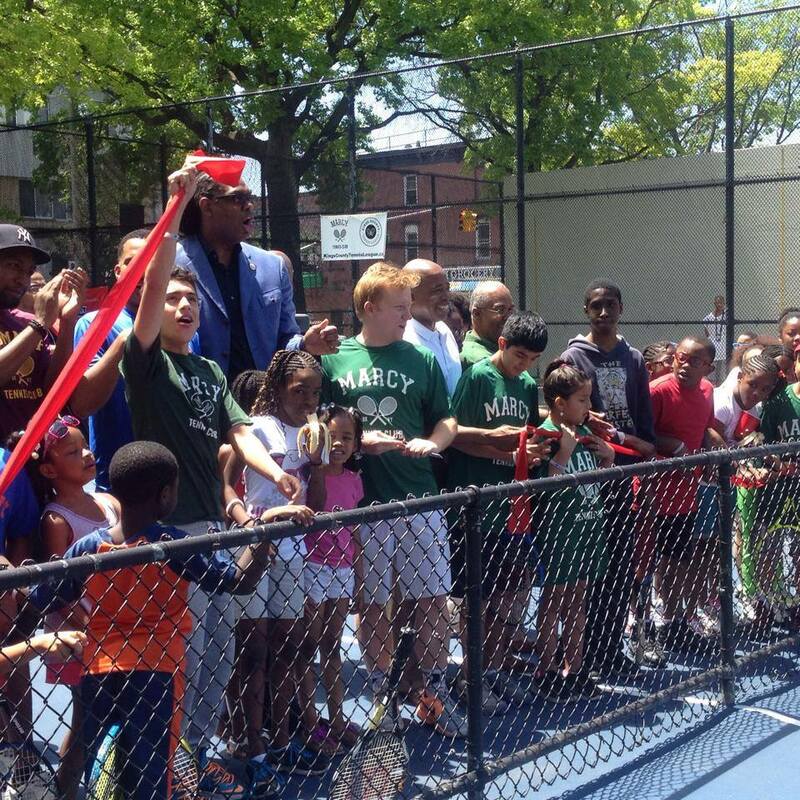 Over the weekend at Marcy, our off-court discussion borrowed the central theme from the day’s earlier ribbon cutting ceremony: community. The ceremony unveiled our newly restored, beautifully painted blue tennis court—but our celebration didn’t stop there. Together with students, parents and volunteers from all four KCTL sites, along with local leadership figures, we also celebrated something more meaningful than a tennis court--our community. Speakers at the ceremony praised KCTL’s impact on the community, and expressed confidence that the new court will intensify this positive influence. Brooklyn Borough President Eric Adams and 36th District Council Member Robert Cornegy applauded our program’s creation of a new community. KCTL is a fusion of children, parents and adult volunteers in safe and fun learning environments, they said. KCTL president and founder, Michael McCasland emphasized that the new facility welcomes an entire community. Although it’s located at the Marcy Playground, closest to the Marcy Houses, the renovated space is open to all KCTL students, including those who reside in Tompkins, Sumner and Lafayette Gardens. After the ceremony, we talked about community in our off-court discussion to round everything out. Appropriately, some of our neighbors in the community sat alongside us, since we’d invited students and volunteers from Tompkins to join our site for the day. In our conversation, we explained that communities are best defined by where you live. We pointed out how earlier that day, we had united four communities to join as one. With this understanding, the kids told us about the importance of taking care of your community and its resources. If someone’s damaging community property—say, with graffiti or breaking glass—you should ask them to stop or alert someone who can help. The students learned that any community is strongest when its members interact in cooperation in pursuit of common good—just like the community we’d come together to celebrate earlier in the day. During our off-court discussions at Marcy last weekend, we talked about Friendship, a topic that perfectly complimented our first class dedicated to rallying. Our chat about Friendship was actually inspired by the previous class’ talk about Values. Noticing that the students gave little prioritization to friendship in the Values Ranking exercise, we decided to lead an entire discussion about the people we call our friends. We got the kids talking about what makes someone a friend. They identified two important features of friendship: having common interests and being able to trust one another. We also helped the students to distinguish between their friends and best friends. The kids overturned the idea that a best friend is someone who is simply physically close to you all the time. One student, Brenda, proved this by explaining that her best friend goes to a different school than her. Although they’re not by each other’s side everyday, their frequent communication keeps their friendship afloat. So, what does this have to do with rallying? Until Saturday, our lessons had kept the game of tennis entirely “one-way”: focused on hitting forehands and backhands over the net or at a target, never returned by a fellow student to initiate back-and-forth play. Our groundstrokes drills—with balls fed directly to students to improve their form—explored tennis only from the standpoint of the individual player, without considering what the game really is: hitting with another person or people, sustaining a rally. Rallying is easily likened to friendship. Like maintaining an exciting rally, keeping a good friendship requires effort and responsiveness on both sides. A life with strong friendships is definitely more meaningful and than one without them, all alone—just like tennis is much more fun with someone else on the other side of the net, playing against you!